A perfect healthy side dish to any Asian-inspired meal. It gets better the longer it sits, so it's perfect for potlucks too! To make the dressing, mix all of the dressing ingredients together in a small bowl. 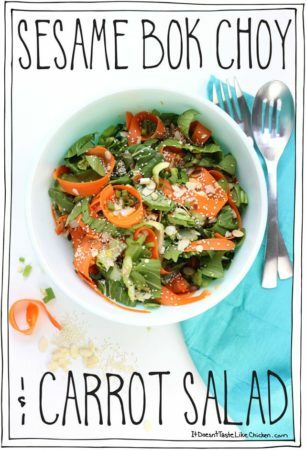 To assemble the salad, add the bok choy and carrots to a large bowl. Pour over the dressing and toss well to combine. You can serve it right away, but the flavours get even better if you let it sit for 20 to 30 minutes, tossing every now and then. When ready to serve, garnish with the toasted almond slices, green onions, and sesame seeds.